The first two of these three early recording artists came from Avoyelles parish, Louisiana, which lies "along a part of the northern fringe of what might be considered Cajun country ... (their) recordings are the only examples known to exist from this locale prior to the 1940s", to quote from the booklet notes. It may be that this dislocation from where the rest of the action was in the development of Cajun music, is responsible for the fact that their sides characteristically sounded quite different from most of what was recorded at the time (the 1920s). The blind singer/guitarist Alcide Gaspard was born in 1880, so would have been in his 40s when he made his only recordings. Sur le Borde de l'eau sounds to my ears like a traditional song that could originate back in France - with its modal tune, and tragic and possibly allegorical narrative about the loss of a ring and the death of a handsome young sailor. Gaspard's guitar accompaniment is no more than a rudimentary strum, although he creates quite an interesting and pleasing effect by ending each section on a major chord. Oh Natchitoches is presumably not so old, although it's possible that the location name was changed at some point in its history. Again, his approach is very plain - a straightforward delivery of the story with an unfussy (even simplistic) accompaniment, the only embellishment being a whistled chorus at the end. Assi dans la Fenetre is another waltz, probably more modern, but still sounding traditional in its overall conception and delivery. Mercredi Soir Passe is a real mixture - the tune has a bluesy feel to it, but notably French Cajun characteristics as well, while the notes tell us that the lyric features the age-old motif : "Who will put on your little shoes, who will glove your hand, etc, etc". The connection between Gaspard and the fiddle player/singer Delma Lachney is a clear one - the former played guitar on the latter's records (although interestingly, Lachney played no fiddle on Gaspard's, recorded at the same session). Research outlined in the booklet reveals family connections as well; Lachney was 16 years Gaspard's junior. La Danseuse is a very pleasing instrumental dance tune - it may have old origins, although it also seems to me to have some of the feel of old-time country music, especially the beautiful double stopping harmonies in the B part. The tune of Cher Ami, Ma Vie est Ruine, certainly relates to Anglophone American traditions, a fact that is perhaps emphasised when he suddenly goes falsetto - almost a yodel - for a few bars. Riviere Rouge must be from the American country fiddling tradition, too. Another of Lachney's instrumentals, Avoyelles, has that syncopated sound and cyclical melody that I tend to associate with Mississippi fiddling, with its powerful African-American influence. So too does La Louisiana, although the effect is undermined by the fact that Gaspard would seem to have had no idea which chords he should be playing. Je M'en Vas dans le Chemin has a feel about it that whispers 'Irish' to me, but it a self-composed song. That's not to say that he didn't know and learn from Irish musicians - there must have been some, even in Louisiana. Baoille is a French waltz, whose lyrics are much closer to the standard themes Cajun themes of love and loss - the repeated verse opening "Ohhh, chere!" is classic stuff, although Lachney handles it more lightly than other Cajuns might. It's the kind of line that they love to holler out with much emotion. Trying to think of ways to describe Delma Lachney's music by comparing it with familiar styles, I come up with the suggestion that generally, Lachney's playing has a sweetness that we probably wouldn't usually associate with Cajun players, and less of the drive that we probably would. On its own merits, though, it shows considerable skill and a distinctiveness that is most satisfying. 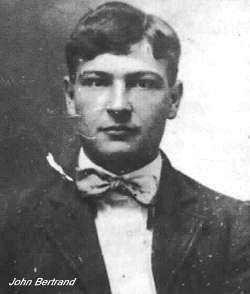 John Bertrand was born in 1891, near Opelousas, more in the mainstream heart of the Cajun landscape, and the same can be said of his music, with its highly rhythmic accordion accompaniment. There seems to be no proven connection between him and the other two men featured on this disc, although the notes do hint that there might be one. In terms of repertoire, though, the common factor is that several of his songs, many of which he appears to have learnt from his mother, would also seem to show Old World origins. But not all - his Valse de Miserable is one of those highly charged Cajun songs of self pity, which (the notes suggest) is autobiographical, telling of his misery at being turned down when he proposed marriage . A small footnote in the booklet tells us that Ann Savoy finds Amede Ardoin's influence in two of Bertrand's songs - Upstairs and La Valse de Gueydan, and I would certainly go along with that, although it seems to me that Ardoin's effect on the music was both wide and far-reaching, so this may not tell us that much. The Swallows, on the other hand, for all its English title, is surely an old traditional French song, and Le Soldat Fatigue and Le Pont de Nante could easily be. Le Fille du Geolier is certainly grisly enough in content to suggest an ancient source - like a combination of The Fair Flower of Northumberland and The Gallows Pole, but without the latter's happy ending. Le Delaisser sounds like a sing-along Victorian music hall song to me. Bertrand's records all featured guitar accompaniment by one Milton Pitre. His playing is rather odd - he seems to be repetitively plucking single or double strings rather than playing chords. He doesn't always hit the right harmony, but that may just have been recording session nerves, and most of the time it's quite effective. 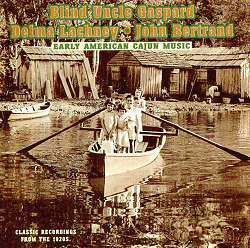 A collection like this - offering a close look at the music of individuals from the first decade of Cajun recordings - is comparatively rare, even in these days when there is no shortage of this music on the market. It is rare, too, that the repertoires of such artists (or at least as those repertoires are apparent from recordings) are so rich in material that seems to reach back into tradition and history - although the incredibly broad spectrum of musics from Louisiana's diverse cultures, that went to influence the making of Cajun music as we know it, is also well represented. A note on the inset card expresses the view that this music "... is softer and more introspective than most other (Cajun) styles". I'm not sure I would go along with that at all. It's true that the high intensity - the driving rhythms, the emotional hollering - that often characterises Cajun recordings (and that is probably what attracts most people to it, at least initially) are rarely in evidence here. But the content of these songs - sometimes tragic or violent, sometimes mysterious or strange - is anything but soft. As for introspective - if anything, the no-frills delivery of narrative balladry seems to me to be as much a social activity as the making of dance music; in fact, often one in which the listener is engaging directly with the singer. Whatever you want to call it, though, this is deeply involving and satisfying music, and otherwise, I have no quibbles with the notes, which offer lots of added value in the form of historical and biographical background, lyric transcripts and translations. The sound quality is outstanding, given the age and extreme rarity of these discs, which is not to say that it isn't rough and noisy in places. There isn't enough early Cajun music available on CD to make this release anything less than essential, especially to anyone who is interested enough to explore beyond the familiar. All of which, of course, is nothing less than we would expect from Yazoo.